Home > Services > A lumbar microdiscectomy is performed to relieve pressure on nerve roots caused by a severe herniated disc in the lumbar spine that causes sciatica like pain. The lumbar spine is the lower area consisting of the bottom five vertebrae. A herniated disc may cause lower back pain and pain or numbness in the legs and feet. Surgery may be needed if symptoms include severe leg pain, weakness or numbness in the extremities and impaired bowel or bladder function.A lumbar microdiscectomy is a minimally invasive procedure. A microscope is used to view the area through a small incision aroud 2 c.m long in the lower back to view the pinched nerve. 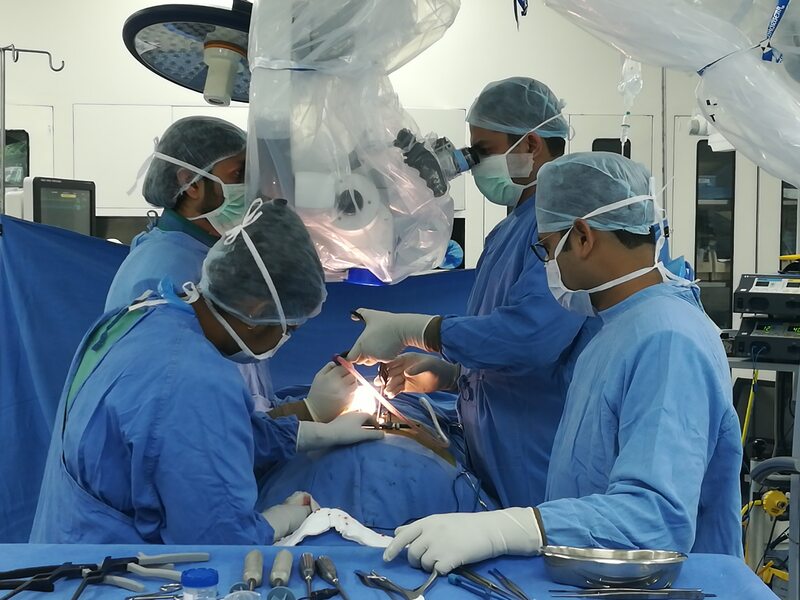 Surgical instruments are then inserted through the incision to remove only the portion of the disc that is applying pressure on it, as well as any disc fragments that may have broken off.Patient is made to sit stand and walk from very next day and is discharged Next day. Stiches, in selected cases, can be can be self dissolving subcuticular which does not require removal. Patient can join back their desk job in 2 weeks. A lumbar microdiscectomy is performed to relieve pressure on nerve roots caused by a severe herniated disc in the lumbar spine that causes sciatica like pain. The lumbar spine is the lower area consisting of the bottom five vertebrae. A herniated disc may cause lower back pain and pain or numbness in the legs and feet. Surgery may be needed if symptoms include severe leg pain, weakness or numbness in the extremities and impaired bowel or bladder function. A lumbar microdiscectomy is a minimally invasive procedure. A microscope is used to view the area through a small incision aroud 2 c.m long in the lower back to view the pinched nerve. Surgical instruments are then inserted through the incision to remove only the portion of the disc that is applying pressure on it, as well as any disc fragments that may have broken off. Patient is made to sit stand and walk from very next day and is discharged Next day. Stiches, in selected cases, can be can be self dissolving subcuticular which does not require removal. Patient can join back their desk job in 2 weeks.